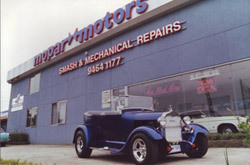 Mopar Motors have been operating in the northern suburbs of Melbourne since 1989. Owner and operators Sam & Georgina Ioannidis originally started the small business as a mechanical repair work shop with a staff of three. With a passion and interest in fabrication and design I always believed in having a business with all its work carried out in house. Things then grew into a panel repair shop with the staff of now five people. Work carried out to all makes and models of vehicles. Restoration and modifications was one of our specialties to all types of cars. Four years later we out grown the premises and built a larger, more modern work shop on the main road of Thomastown known as Settlement Rd. This work shop had been specially designed to facilitate and house more cars, also allowing us to have more equipment area to fabricate and design in house parts. Specializing in the early Chrysler range like the S & R series,AP5 & AP6, the VG & VF the VH to last ever built Chrysler CM range, very passionate about the Chrysler product, owning many different models ourselves, perfecting there character of appearance, performance and most important the handling of the vehicles was our specialty. Another type of vehicle that inspired our business was hot rods, this is when no rules apply on how to build a car just use your imagination and go for it.